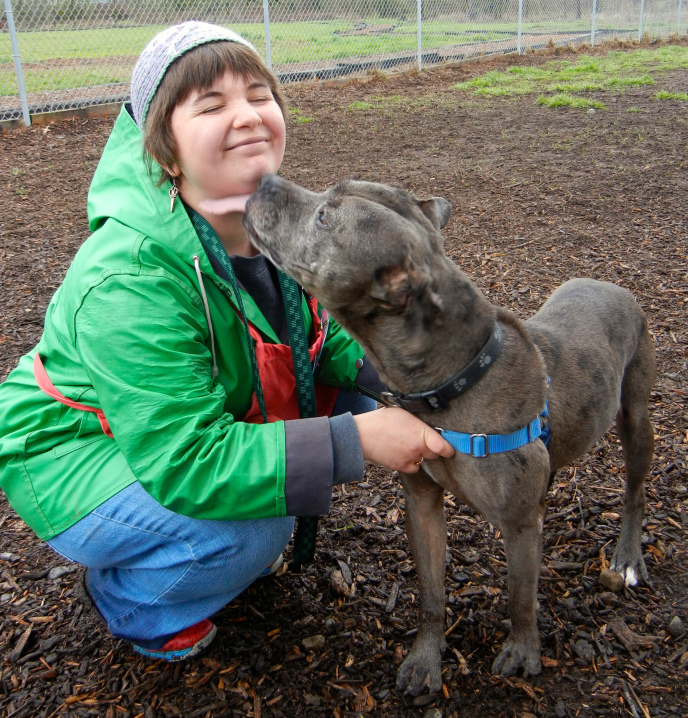 It has been a fantastic week for adoptions of young dogs, old dogs, big dogs, little dogs. In fact there was a total of seventeen dog adoptions! Ten of them were Blog Dogs. I was especially happy on Sunday because I was there when several of my favorites’ families came to take them home and so I was able to say goodbye and snap some pictures. 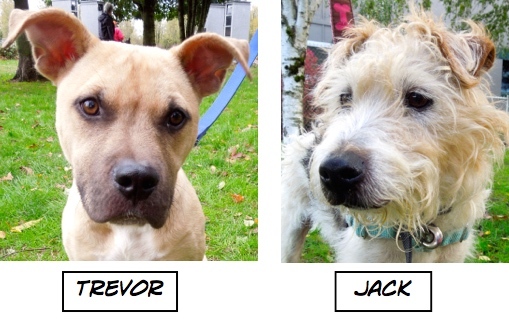 Here are the ten Blog Dogs who are now happily settled with their new families. 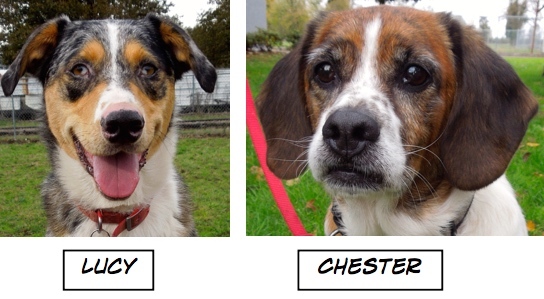 Staff member Cassidy sent me these sweet pictures of Titan, Abby, and Chester with their new people. I was over the moon when I met Champ’s new person, Steve. He promised me updates and I can’t wait. 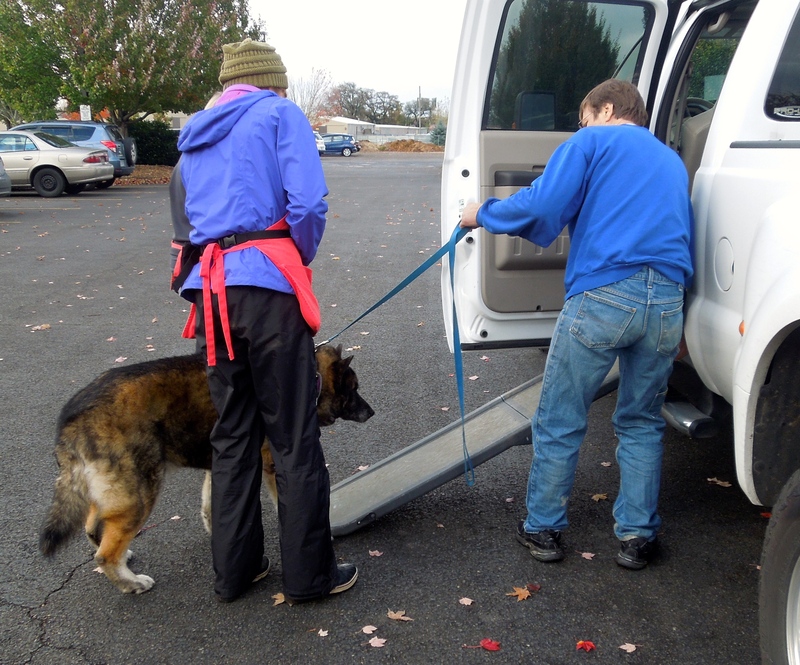 I was so touched that Steve even brought a ramp for Champ to use to get into the truck to go home. It took three of us to coax the boy to go up it, but once in the truck, he was one happy camper! He seemed to know he was going home! And a final note on Champ. I got this update after his first night in his new home. “He is doing grand, so sweet and mellow. All the dogs are doing great together. 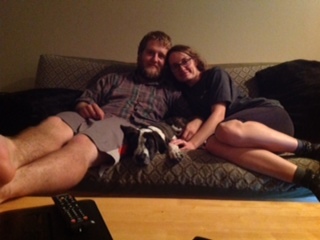 We love him already.” And his name is now Chance. Sunday’s play group was fun with lots of talk. Champ knew that he was soon going home and wanted to make sure he had everything ready to go. 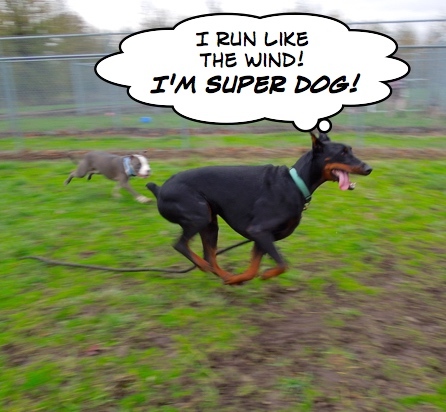 Meanwhile, Dobie, a very energetic four-year-old Doberman Pinscher, loved being free in the Rough and Rowdy yard. 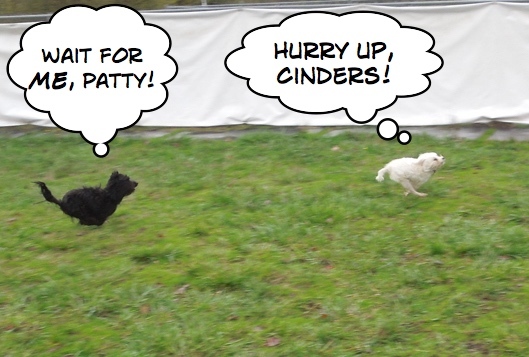 Likewise, but not quite as fast, here are Cinders and Miss Patty in the Mellow Dog Yard. 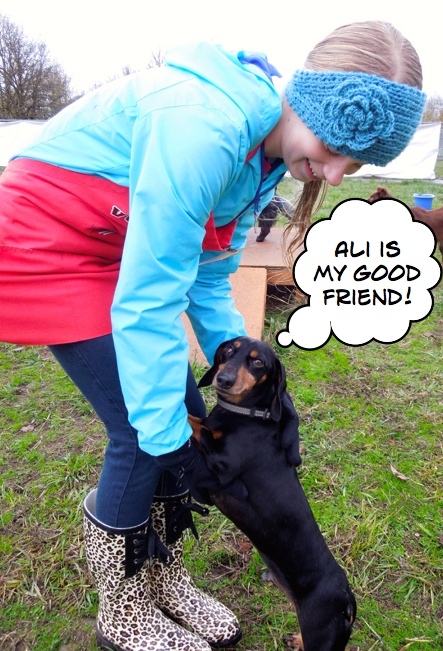 Lenny, a seven-year-old Dachshund, just wanted attention from volunteer Ali. And then he had a question for me. 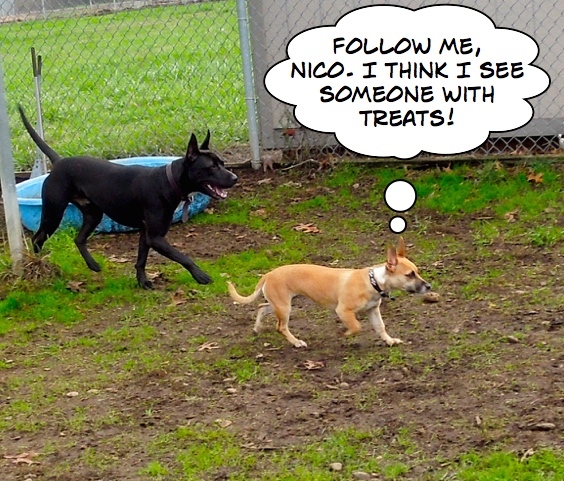 In another play yard, Nico and his BFF, little Graceland (staff member Jessi’s pup), romped happily together. 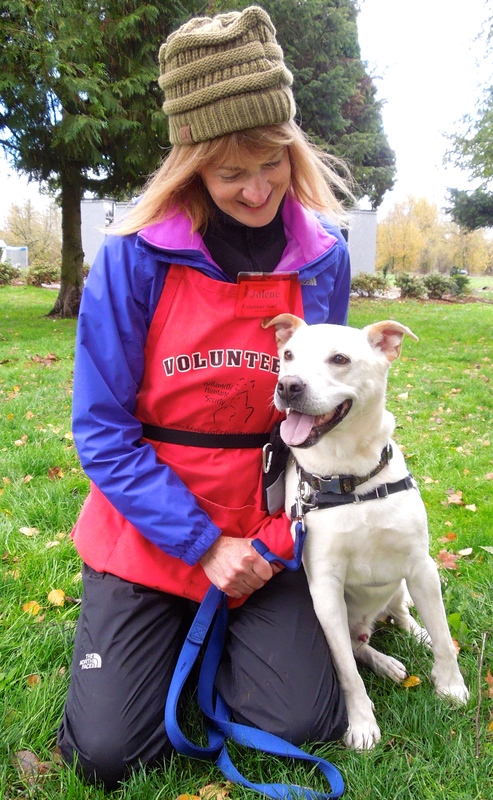 Nico has improved so much since volunteer Linda has been working with him. He’s a great boy! I was here as a puppy. I’m back now. 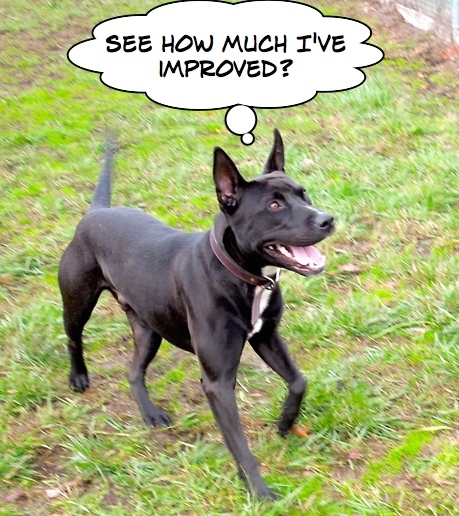 I first wrote about Nellie when she was here last June as a Pit Bull Terrier puppy in Junior Trainers Camp. Here she was with her trainer Mary Jo. Nellie was quickly adopted but was surrendered last week. She’s grown up some, and here she was Sunday with Diane. 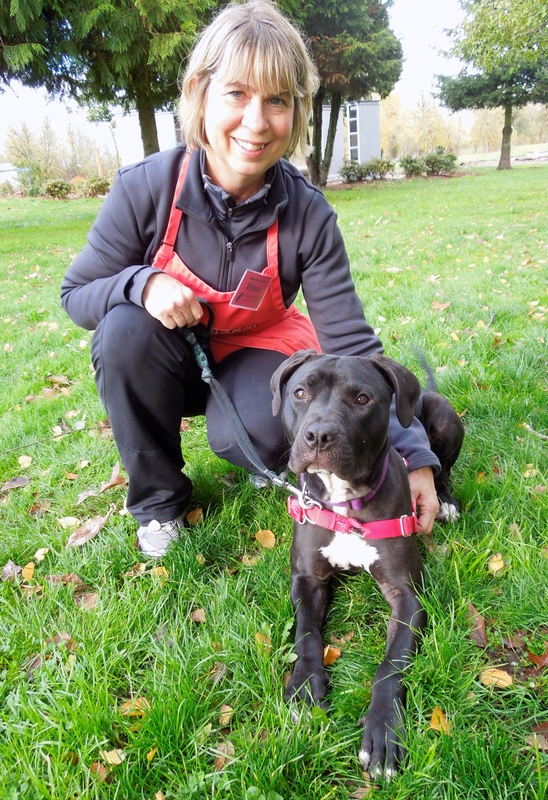 Nellie is now a ten-month-old, fifty-one pound youngster who is happy, playful, and full of life. 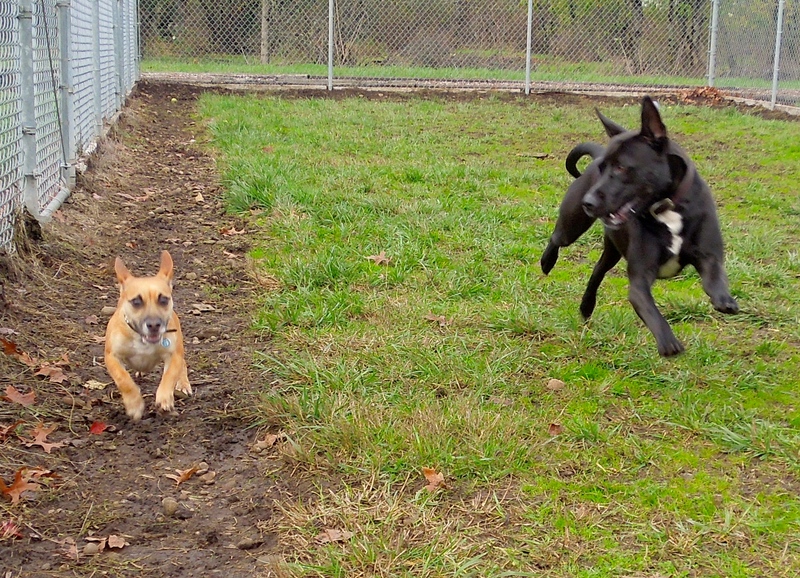 She had a great time romping in play group on Sunday. She is looking for an active and patient family which is willing to fine tune her potty training (she needs consistency) and who has the patience to teach her what to chew and not chew, as she can be a little mouthy in her anticipation to meet the world. 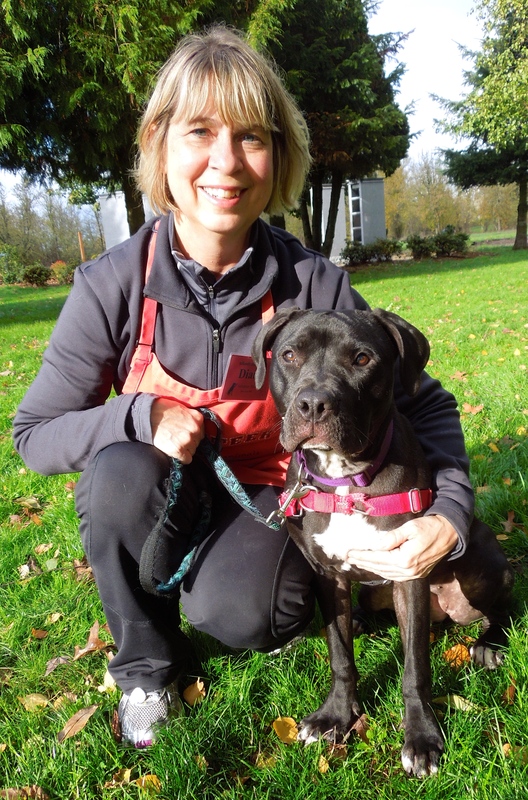 With the proper training and understanding, Nellie will grown into a wonderful family dog. 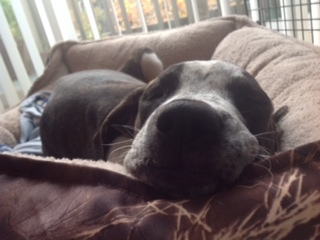 I’m in a foster home now and doing great! Want to adopt me? 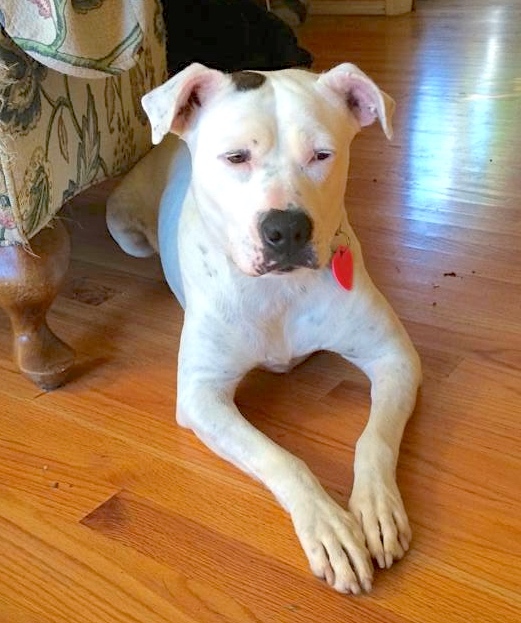 Last week I wrote about sweet Miracle, a four-year-old Boxer/Dalmatian mix who was terribly shy and uneasy. Here she was with Wendi last Sunday. She had such a worried look in her brown eyes and tucked her tail. Then a wonderful thing happened. 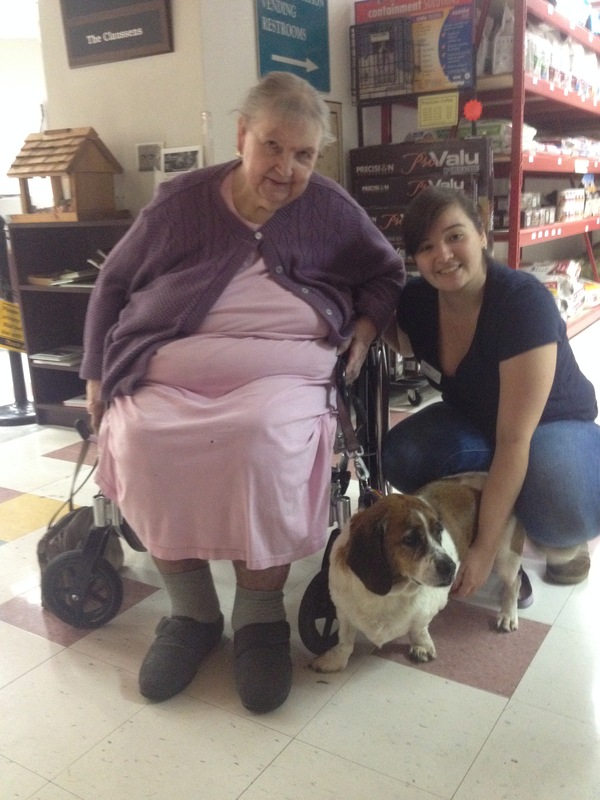 Volunteer Laura (who had fostered Springer, then Bella until they were each adopted) took Miracle home. I was so happy to get this report yesterday. 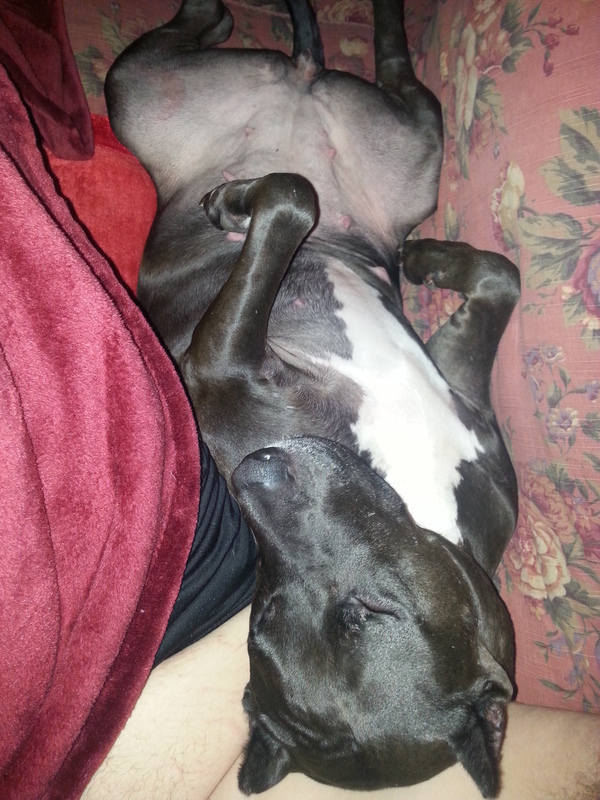 Look how relaxed Miracle looks in Laura’s home. 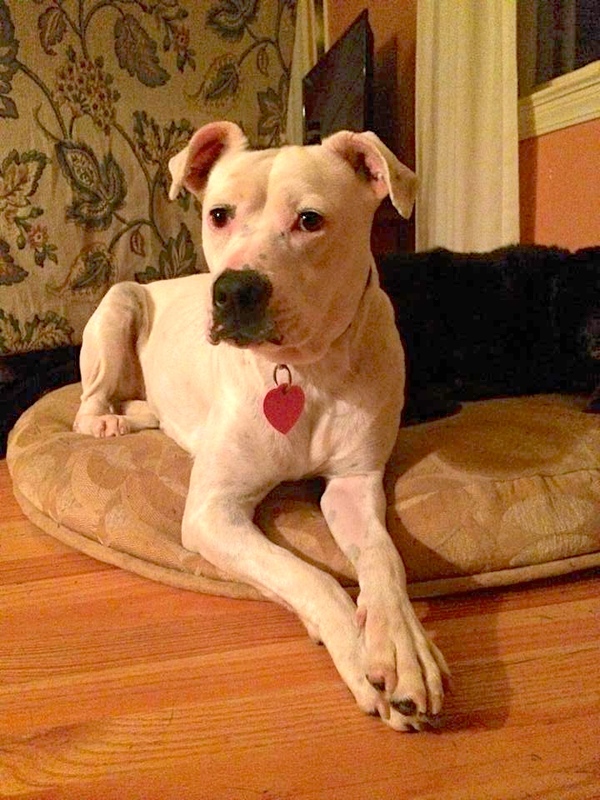 We’re hoping for the perfect person to come along and adopt this beautiful girl. What do you mean I’m a little guy?! 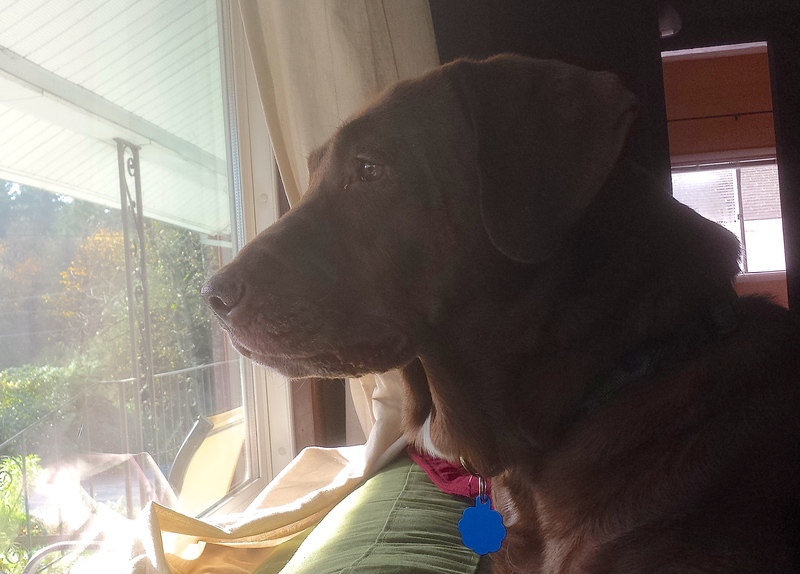 As you saw in the play group cartoons, Lenny is a “people dog.” That isn’t to say he isn’t a “dog dog,” because he is. His best friend was Chester who got adopted a few days ago. 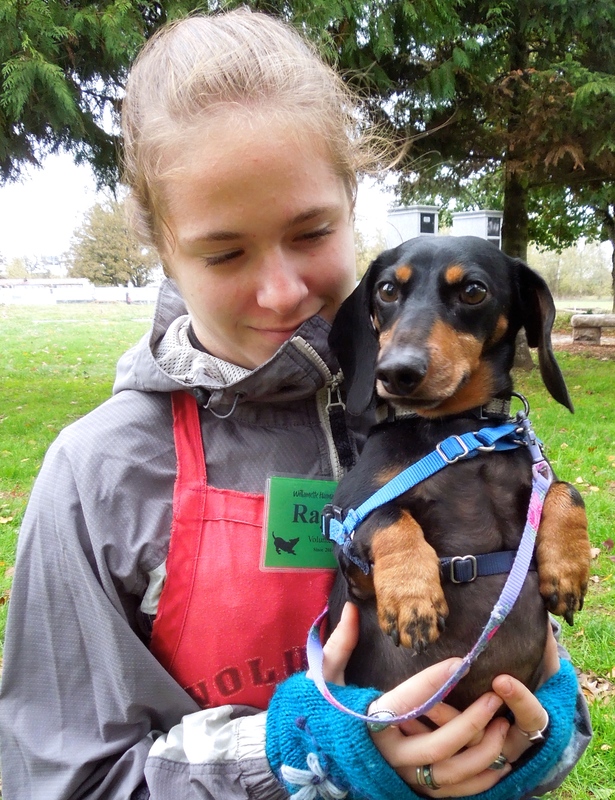 He enjoys play group, but his favorite place to be is in a person’s lap. He also doesn’t mind cats. He would probably do best with older children, a little ones can make him nervous. Lenny is a seven-year-old Dachshund mix. 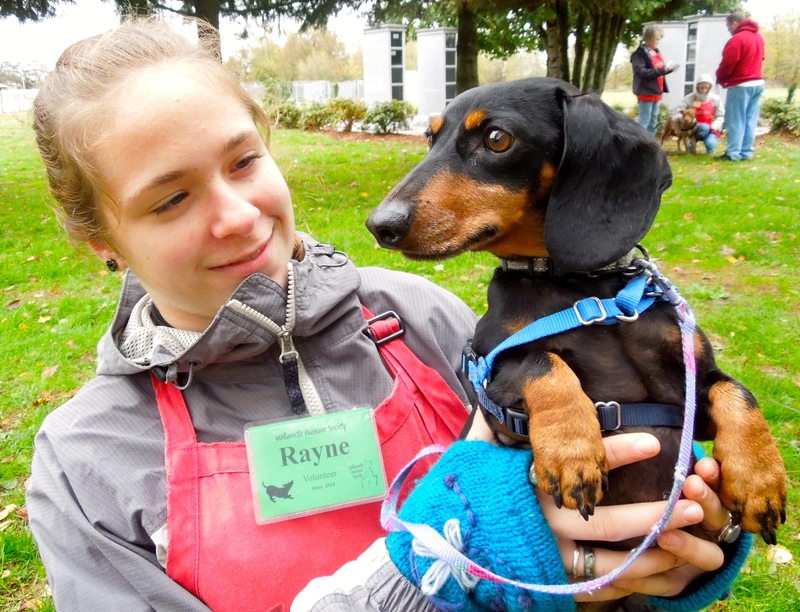 Here he was on Sunday with Rayne. There was once a dog. 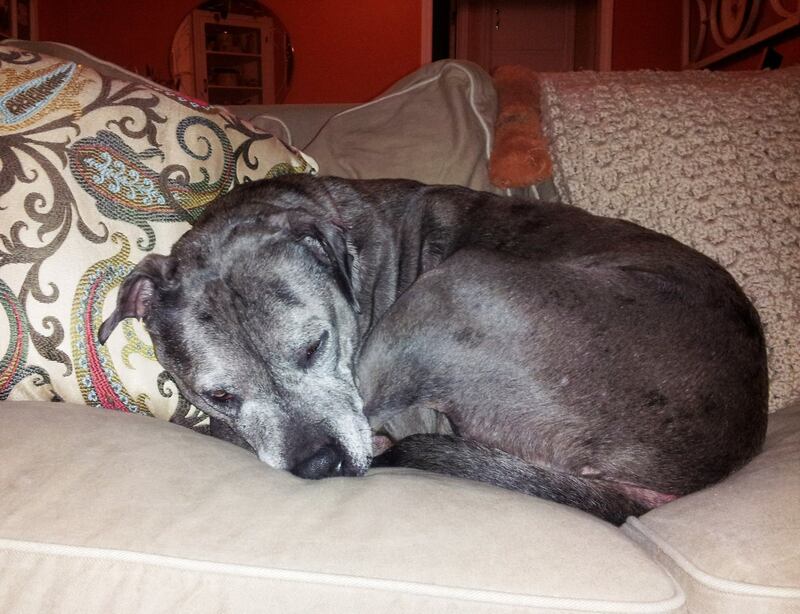 Her name was Cassidy and she was a seven-year-old Pit Bull Terrier mix. She wasn’t pretty. She always looked worried. She had been found as a stray wandering the streets in California and was transported by the S.T.A.R.T. team to WHS, arriving on December 2, 2012. 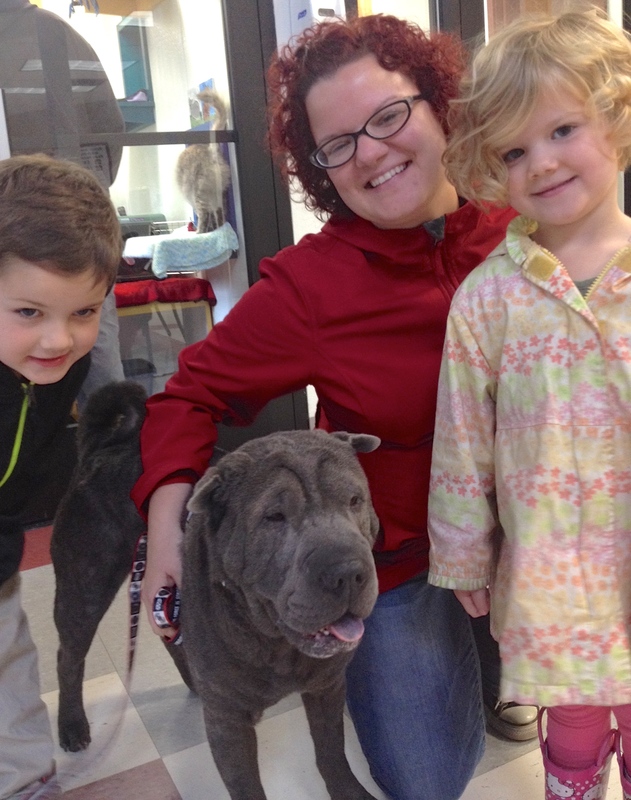 She came with ear infections, skin issues, and a gentle, loving personality. 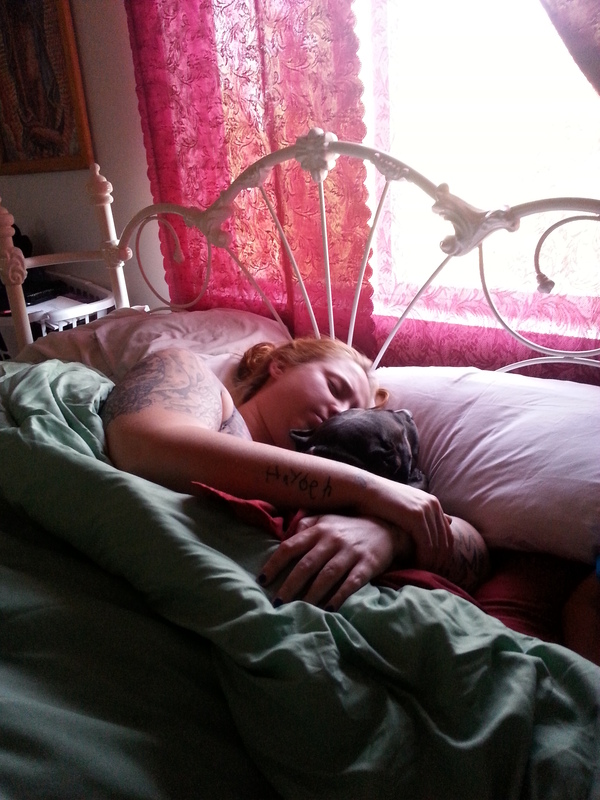 She went to foster care to recover from her health problems and then was put up for adoption. She waited and waited. 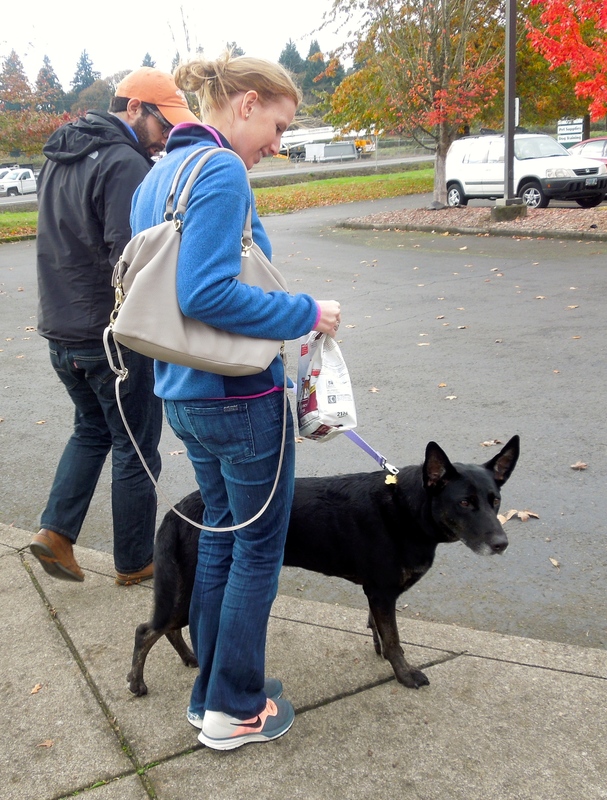 And while she waited, she won the hearts of everyone at the shelter who spent any time with her, including volunteer Sarah. We all worried that no one would adopt her. 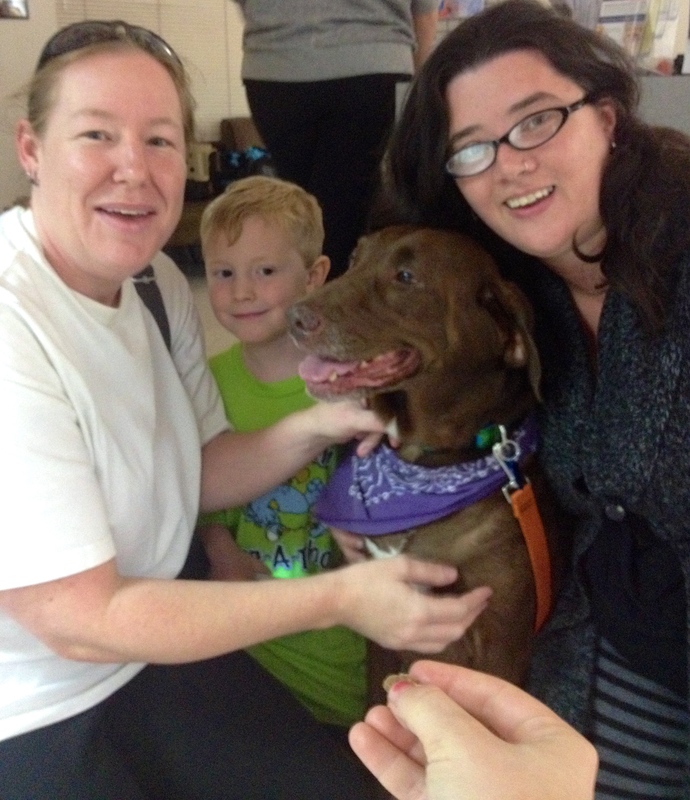 Finally, in March of 2013, Cassidy was adopted and everyone was thrilled as we told her goodbye. Time passed. Volunteer Sarah became staff member Sarah. 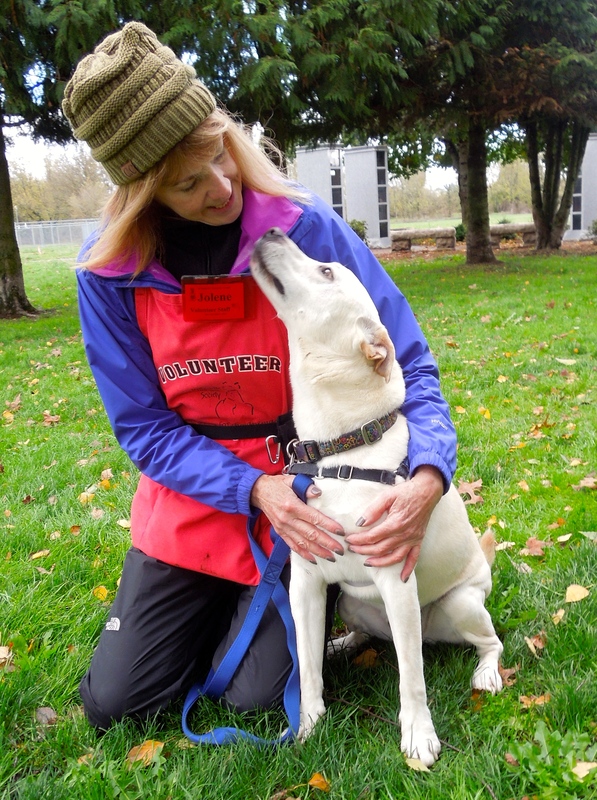 A new volunteer, Marianne, started walking dogs and soon was coming several times a week and helping wherever she was needed. Marianne had two dogs and two cats and though she loved many of the dogs who arrived at WHS, she would always say she was “at capacity” in terms of animals of her own. 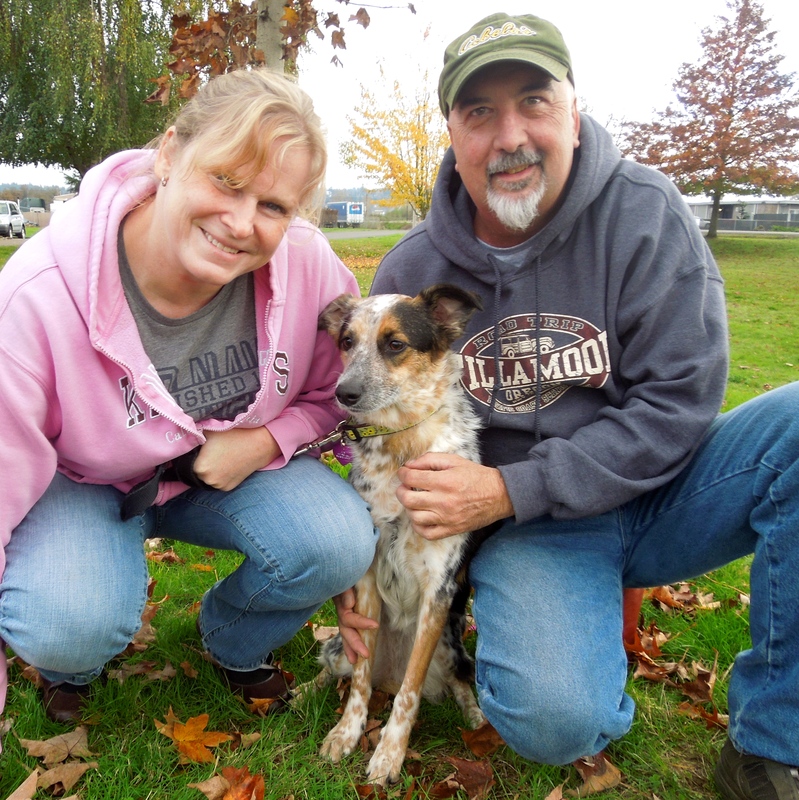 Then last Friday, November 7th, Cassidy was surrendered back to our shelter. I was sad that she was back, but happy to see that she was still the same gentle old soul, now nine years old and with a grayer face. And I worried again if she would be adopted. Here she was on Sunday with Diane. Can you guess the rest of the story? Marianne was just going to take Cassidy home for a short respite. Here are some of the pictures she took. 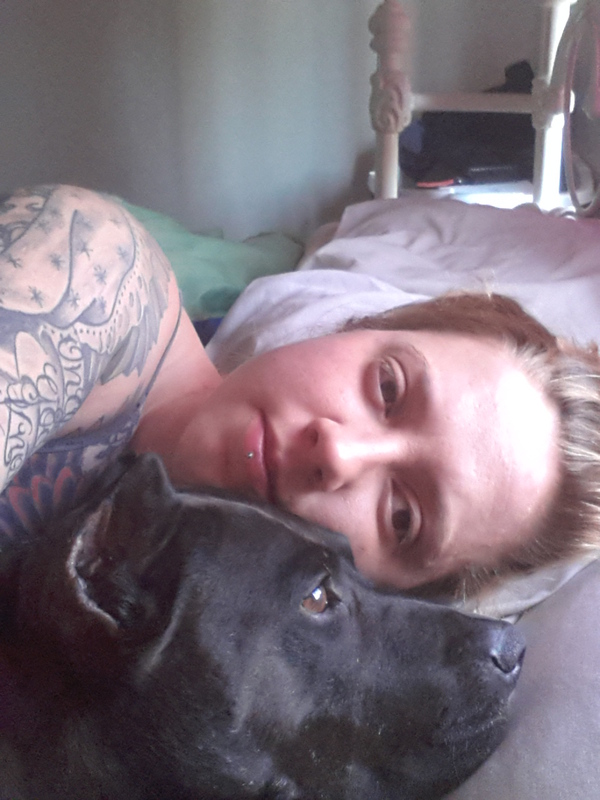 One day turned into two and Marianne started saying things like, “I don’t think I can take her back to the shelter.” Then she emailed me last night, “Cassidy may be my undoing. 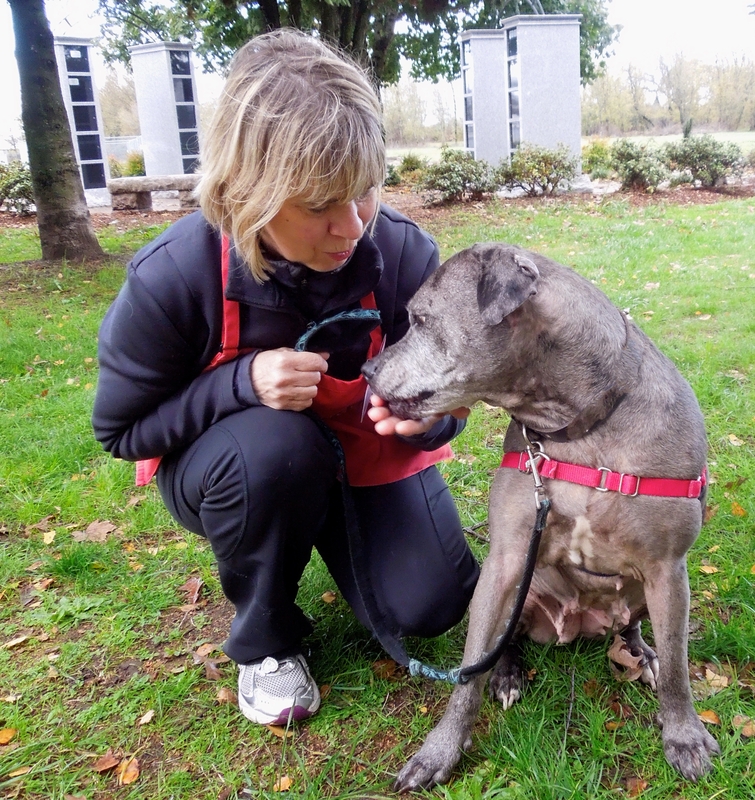 I can’t stand to look at her without wanting to give her the life she deserves.” So on Thursday, this very lucky and deserving old girl will officially get the best forever home she could ever wish for. And that’s the rest of the story! 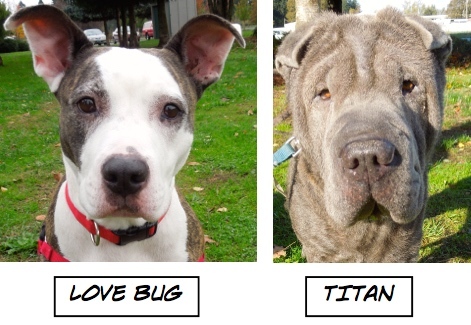 Needless to say, I will get updates on this very special adoption. I just arrived! Who’s ready for an adventure? Oh my. 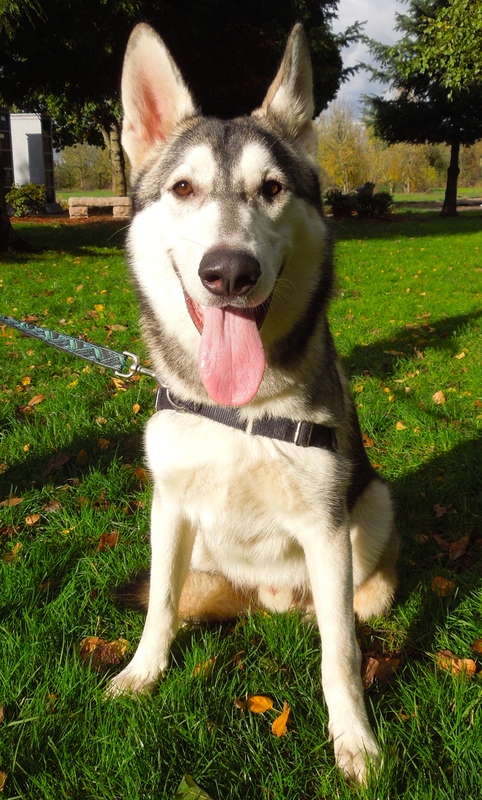 This beauty is nine-month-old Koda, an Alaskan Husky/Shepherd mix. 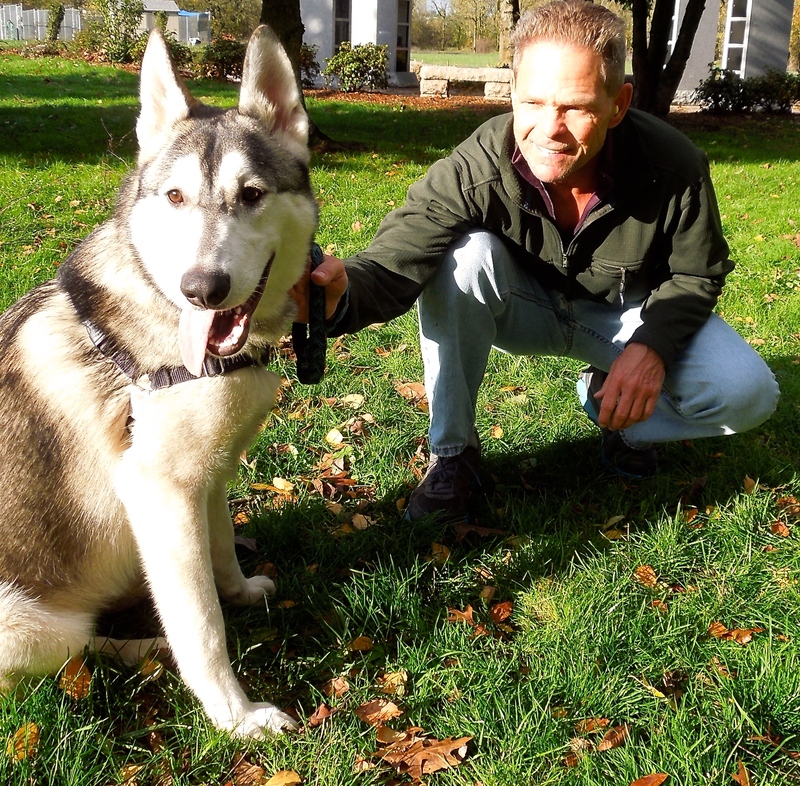 He weighs in at 75 pounds and, no surprise here, this youngster is active! He was surrendered just as I was about to leave on Sunday afternoon. He will need a secure fence, as he loves to go on adventures. 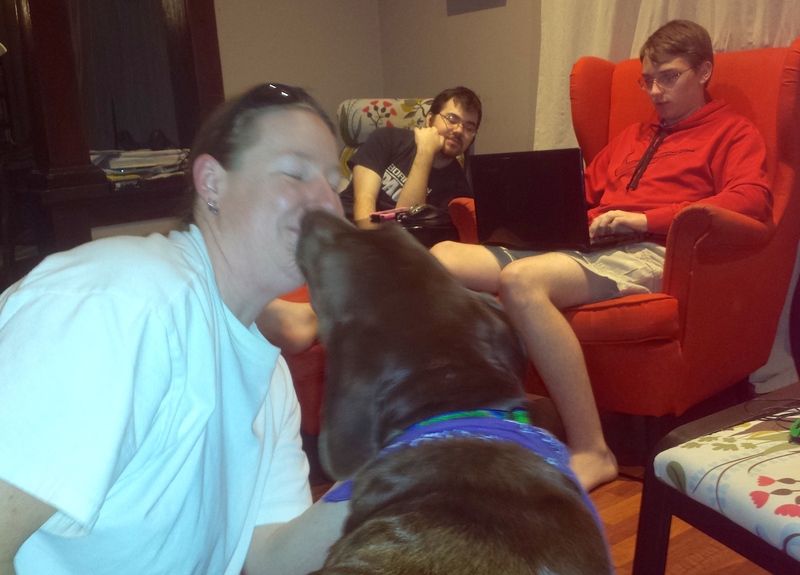 He is house-trained, knows several commands, and to my amazement, took my treats very gently. I have a feeling this boy will be adopted very quickly! Francis enjoyed meeting this handsome character. Happy-go-lucky should be my middle name! 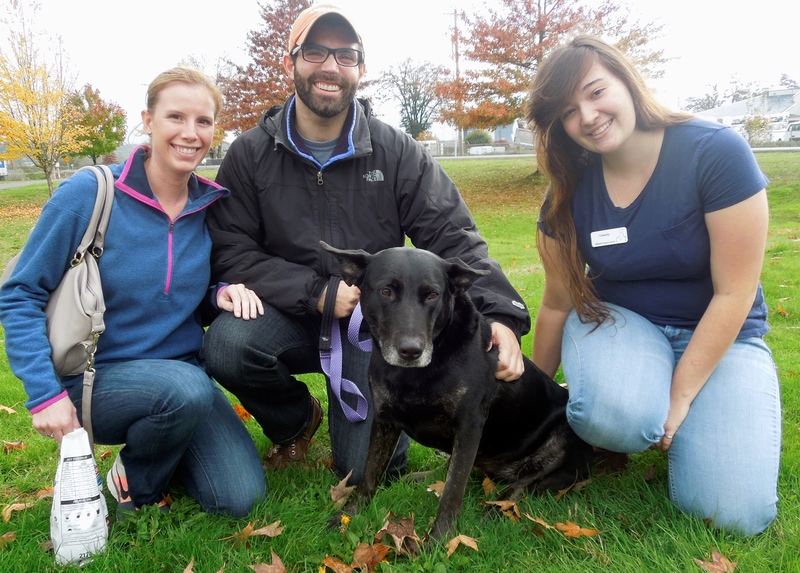 Yep, this smiling dog is Goodwin, a six-year-old German Shepherd/Lab mix that Jolene has fallen for. This boy is always happy and eager to do anything you want to do. 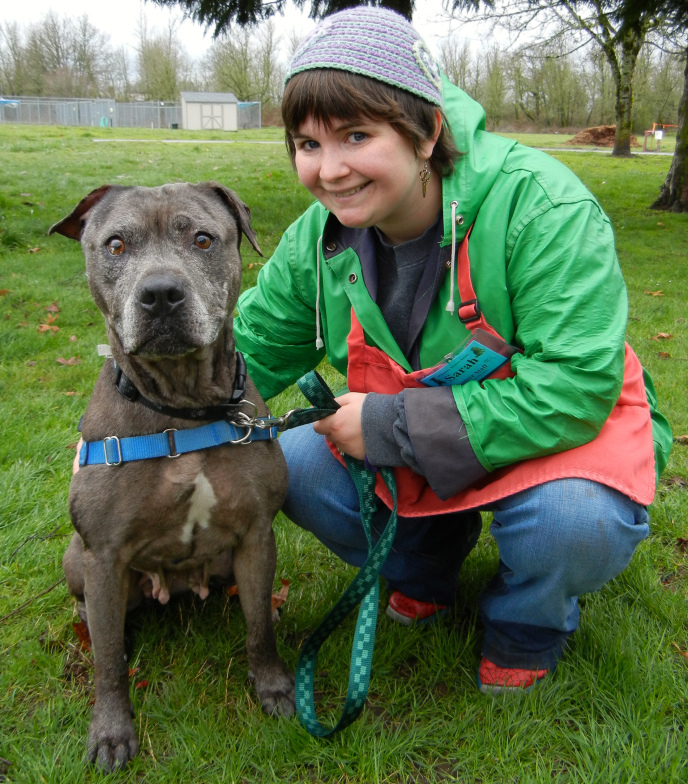 He is treat-motivated and fun-loving, so training will not only be a blast, but easy, too. 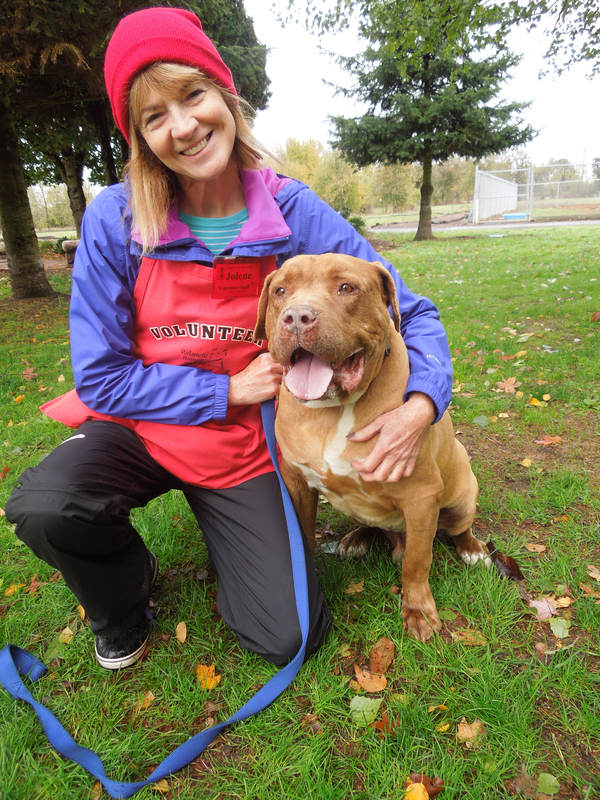 Goodwin is smart, affectionate, and did I say happy? 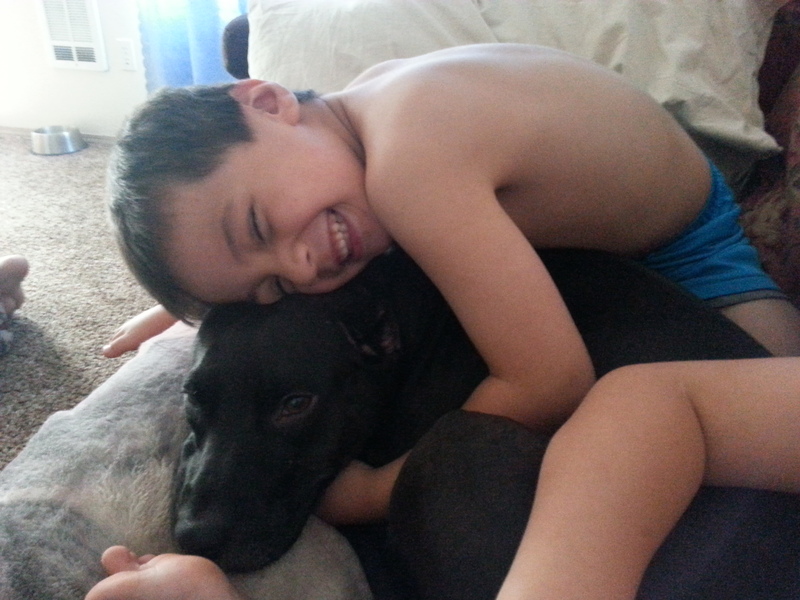 We hope a family looking for a bundle of energy and excitement will find him soon. 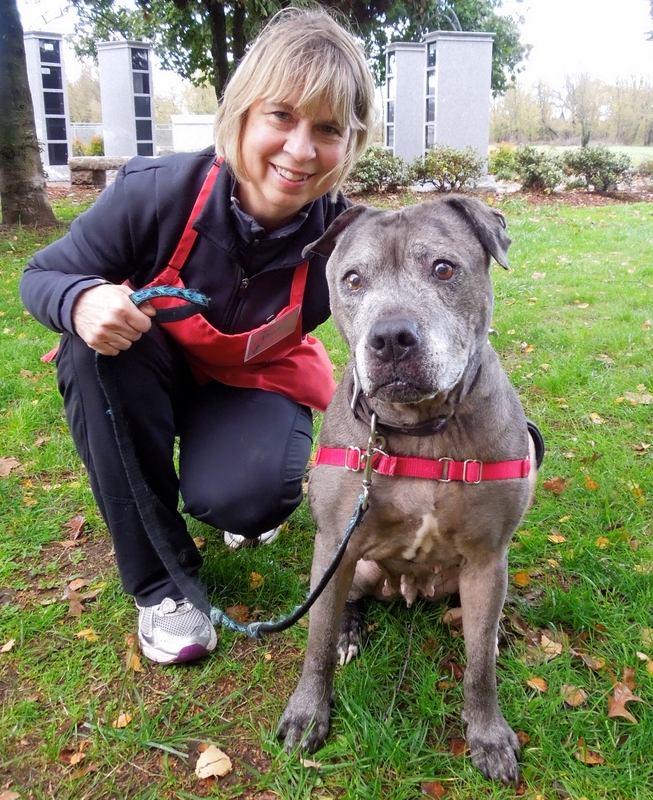 Did you know that November is Adopt a Senior Pet month? How about adopting me? 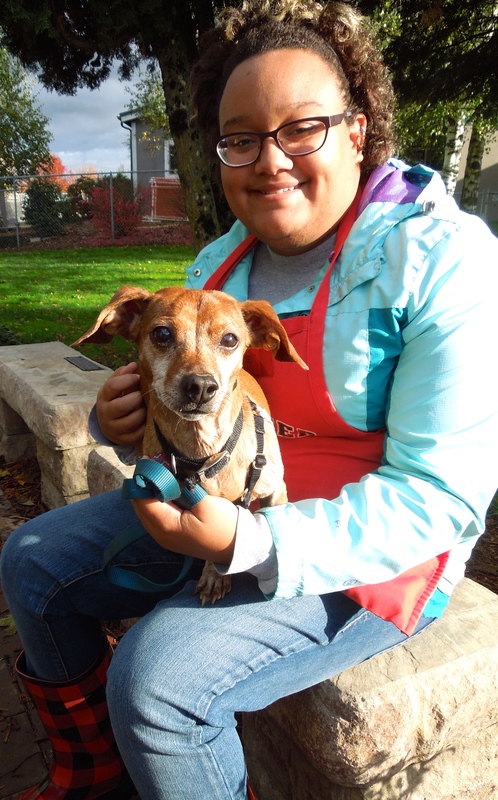 Petey is an eleven-year-old 13-pound Miniature Dachshund. 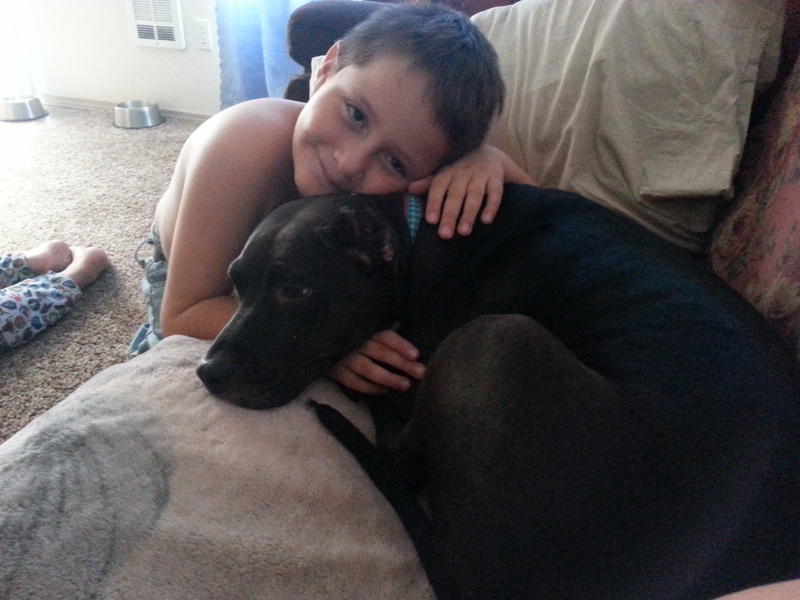 He gets along with other small dogs, cats, and older kids. He has the cutest little prance as he walks and is a happy guy. His one problem is house-training, but with consistency, this would improve. He’s a snuggler and a lap dog. 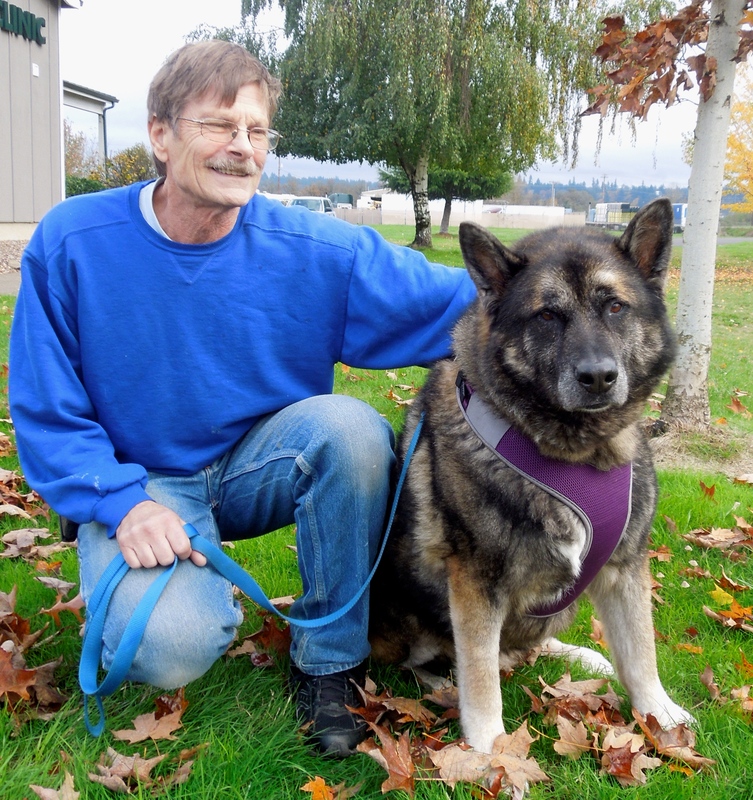 He’s looking for a retirement home where he can be taken for leisurely strolls around the neighborhood, then curl up with his person in the evening. I’m hoping this sweet boy will find a forever home soon. Here he is with Caroline on Sunday. 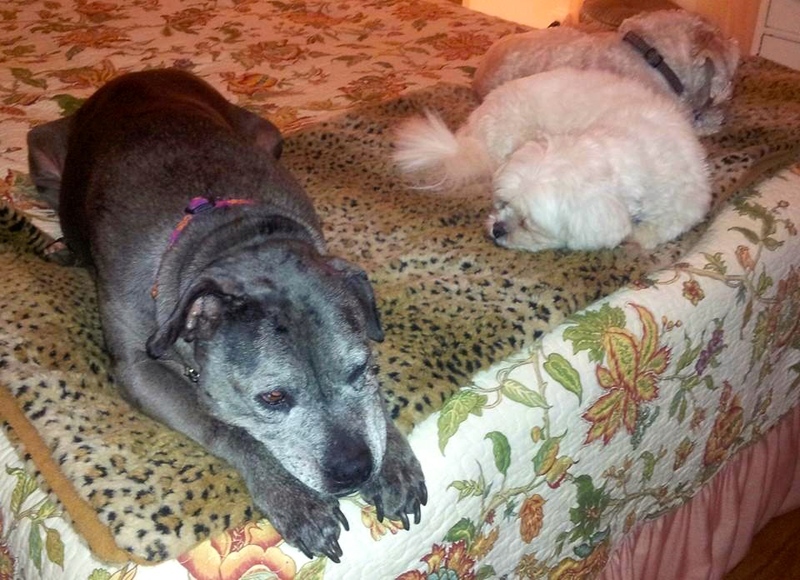 And did I mention that November is Adopt a Senior Pet month? I’m still here! I’m waiting and I’m a great dog! Oden is over his cold and out of ISO, which makes him and us very happy. 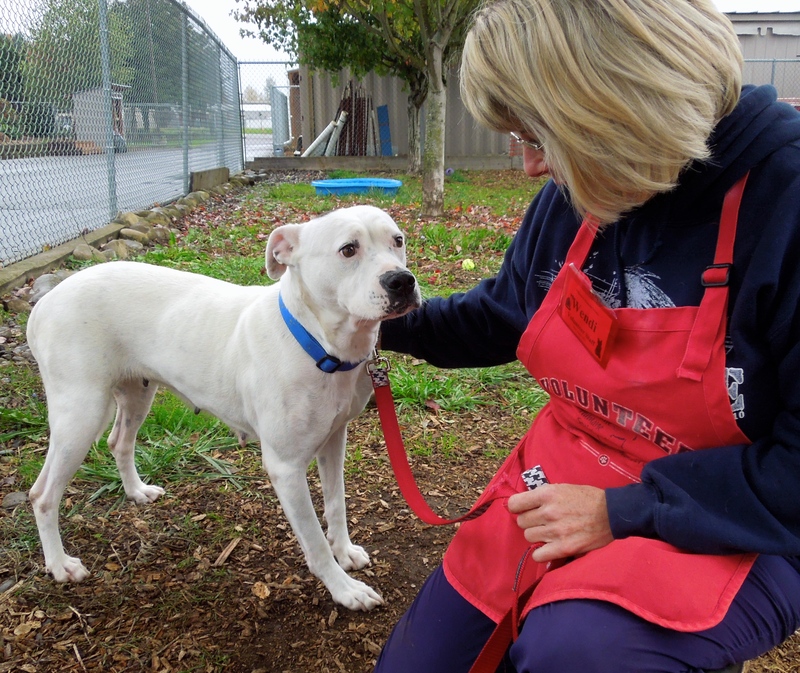 Oden is a one-year-old pup who is full of excitement and love. He would make a great hiking or jogging partner. He is treat-motivated and a quick learner. He does very well with other dogs, but not with cats. He walks well on leash, likes car rides, and is house-trained. He’d love to come to training classes to learn more. 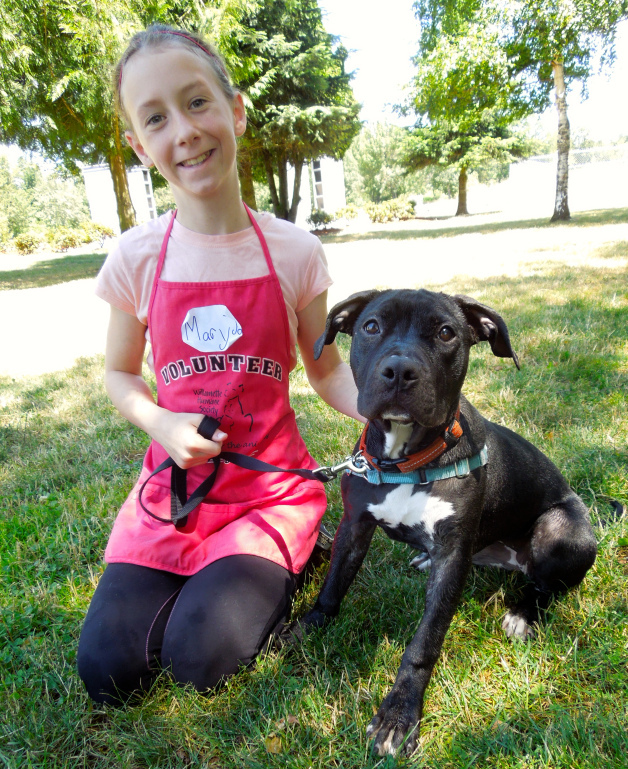 Oden is terrific young dog just waiting for his new family. I hope they come soon. He had a great time with Tyler on Sunday. 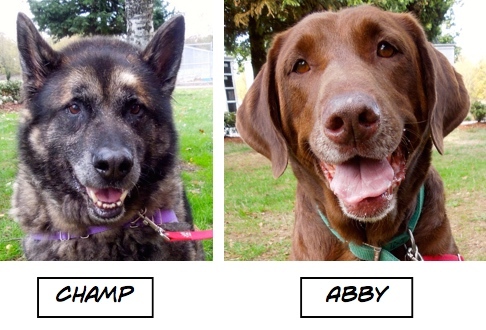 Did I mention that November is Adopt a Senior Pet month? 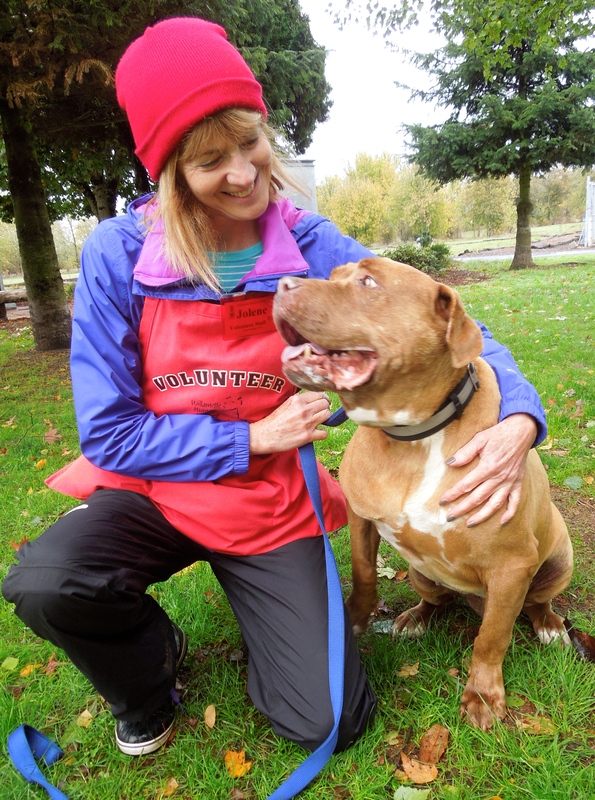 Kane is a 12-year-old Red Nose American Pit Bull Terrier who is a cuddly teddy bear disguised as a dog. 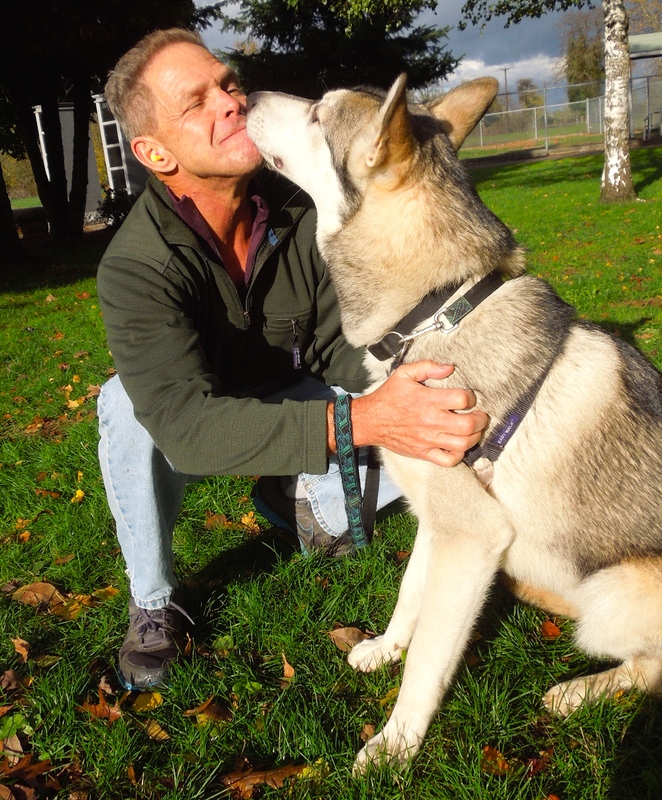 This gentle soul likes everyone and in return everyone at the shelter has fallen in love with Kane. He goes to play group and wants everyone to get along. He goes for walks and likes to stop for belly rubs. 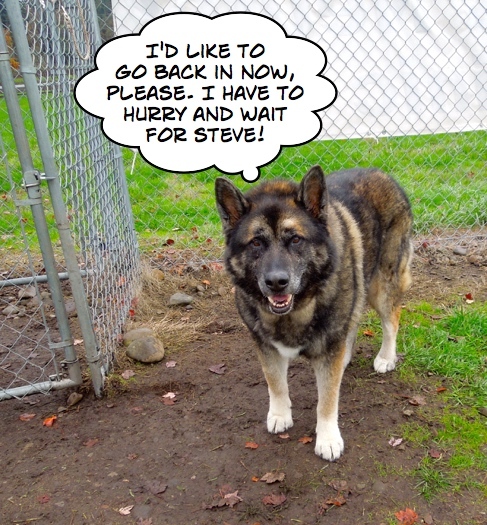 He is simply perfect and is waiting for a home in which to spend his retirement years. 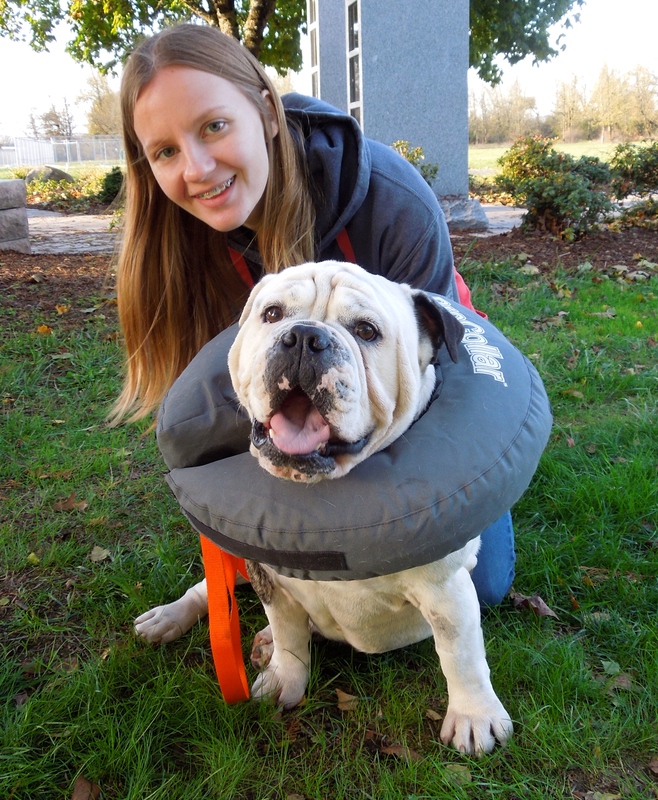 At the moment, Kane is recovering from a cold and is the ISO kennels, but that doesn’t mean he can’t get adopted! 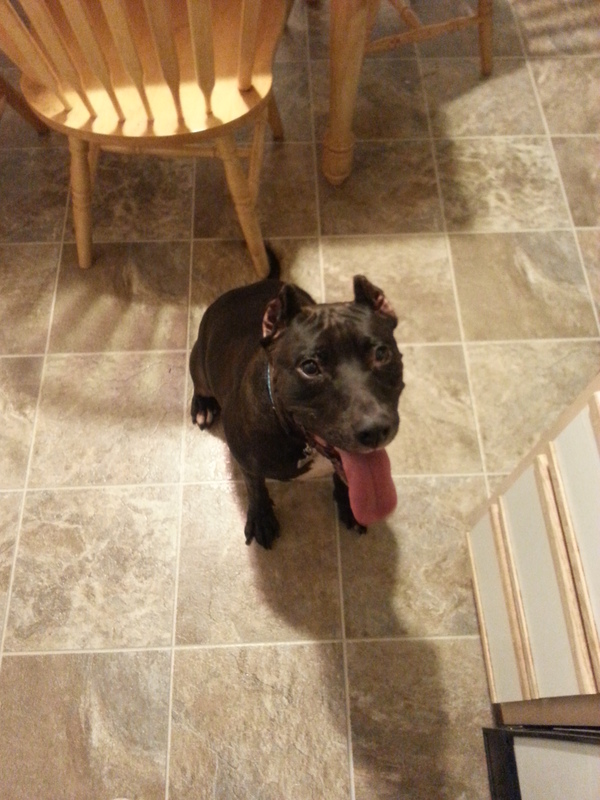 Let’s get this wonderful dog his forever home! Jolene is one of his many fans. 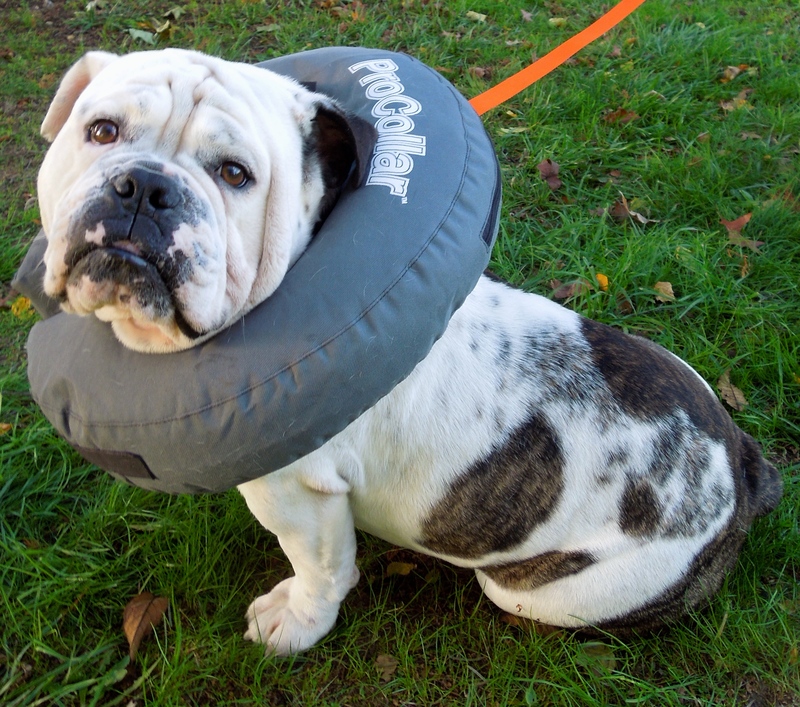 Today Emelynn fell hook, line, and sinker for a clown of a dog, Bubba, a four-year-old Purebred English Bulldog. Bubba is quite the character around the shelter. 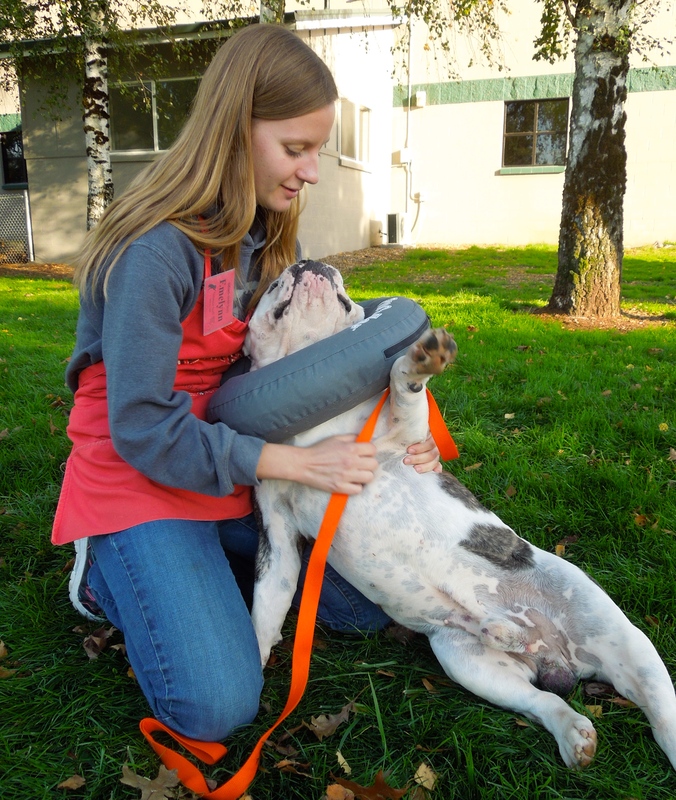 He gets along with everyone and loves play group. 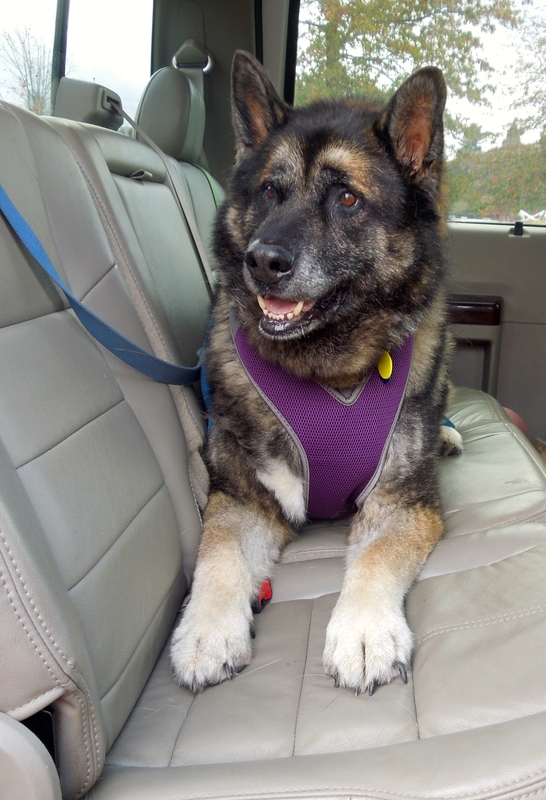 He likes to ride in a car, is house-trained, affectionate and ready to go on any adventure you choose. 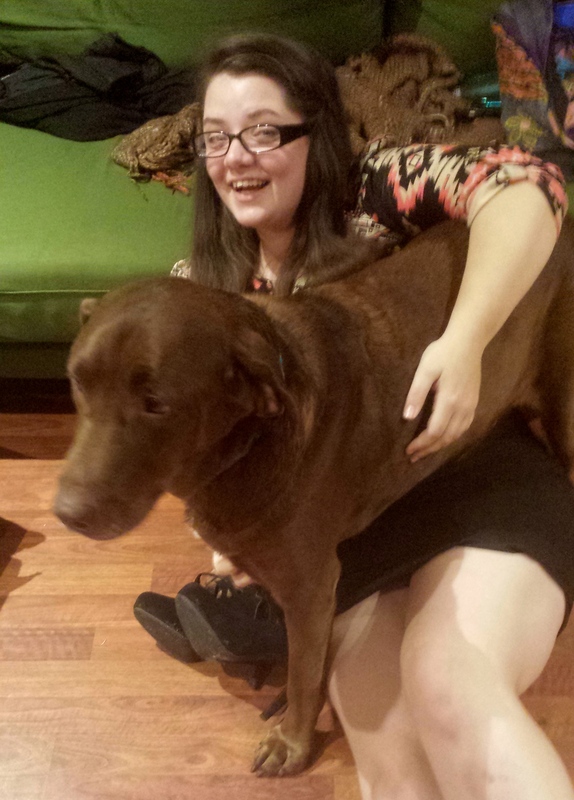 At 70 pounds, this big lug is light on his feet and likes to prance rather than walk. 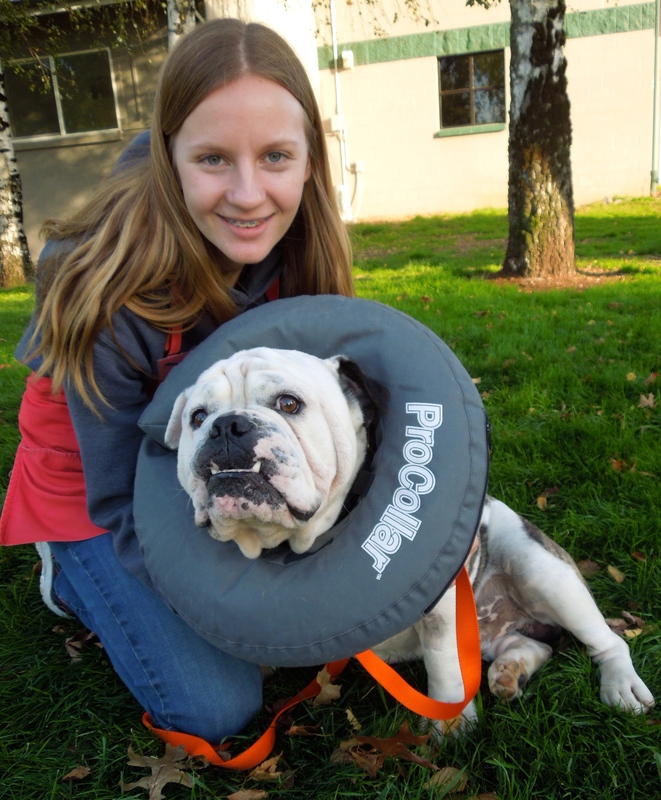 Usually he has a big grin, however, today he was wearing a “donut” after just having been neutered, and he wasn’t thrilled. 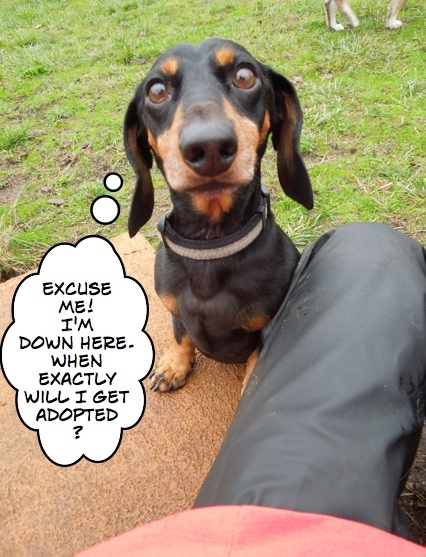 We are sure that this goofy boy will be adopted soon! We’re new here. We’d like to stay together, will you adopt both of us? I met two new pups today and had to tell you about them. 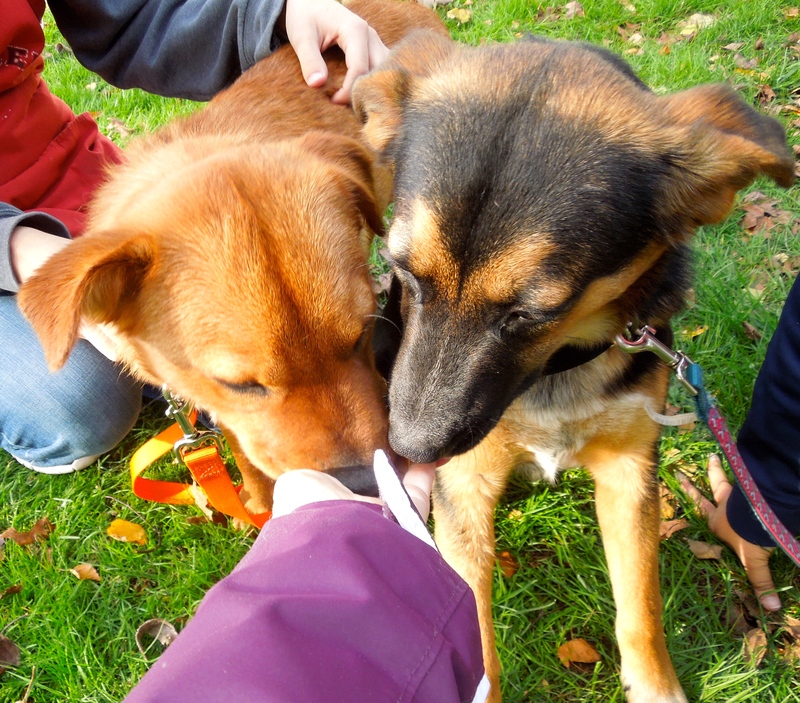 Here are Sunny and Luckee, nine-month-old Rottweiler/Shepherd mixes. 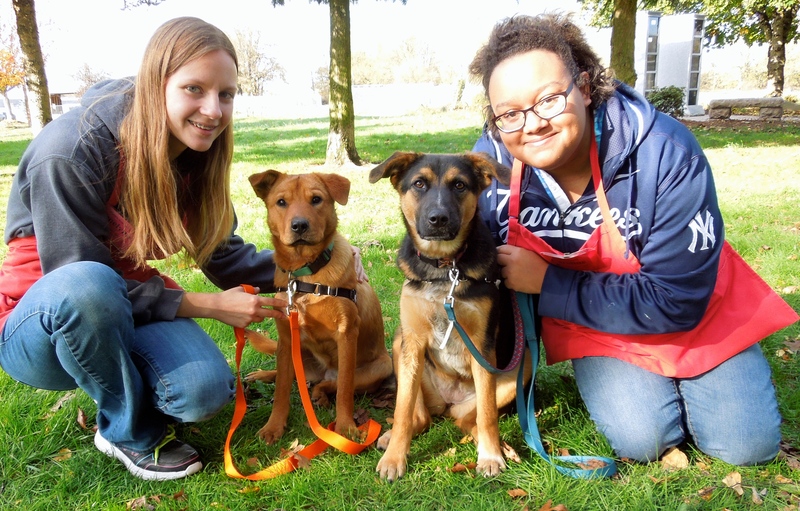 They are house-trained and good with dogs, cats, and kids. 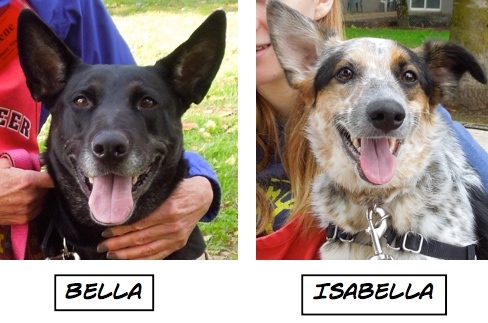 They would be great as first-time dogs for a family. 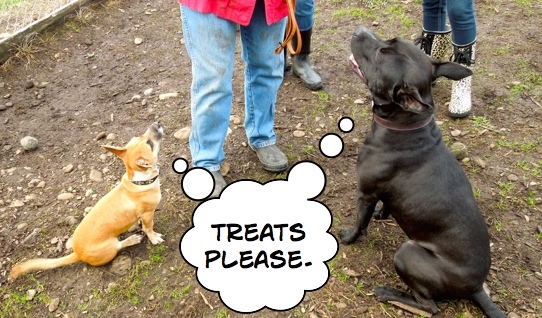 They are gentle and took my treats so politely. 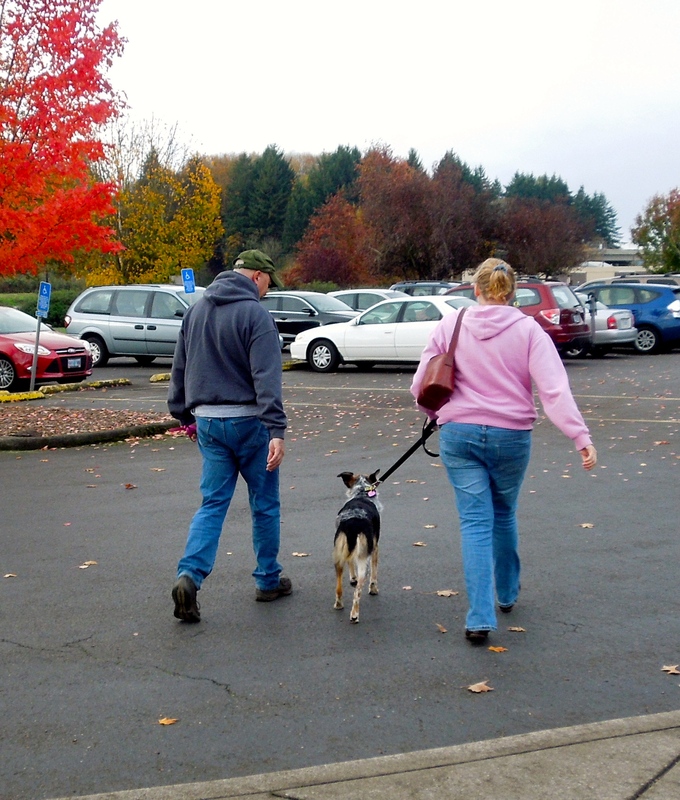 They know several commands and walked nicely on leash. 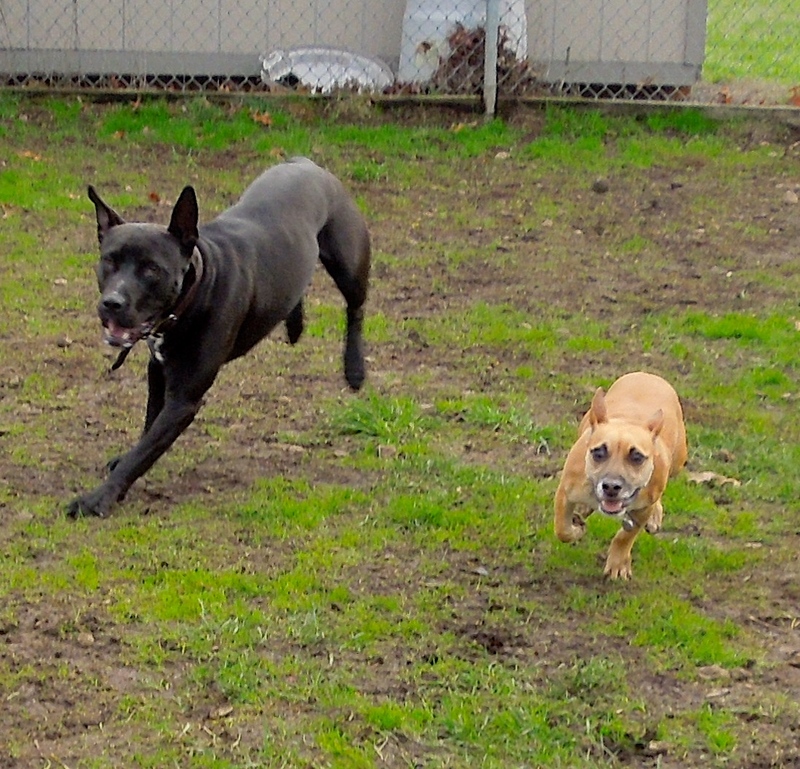 Emelynn and Caroline took them to a yard where they happily romped with each other. While they don’t have to be adopted together, I’m hoping that they will be. They are not only sisters, but best friends and oh, so cute! We have some fantastic updates for this week! 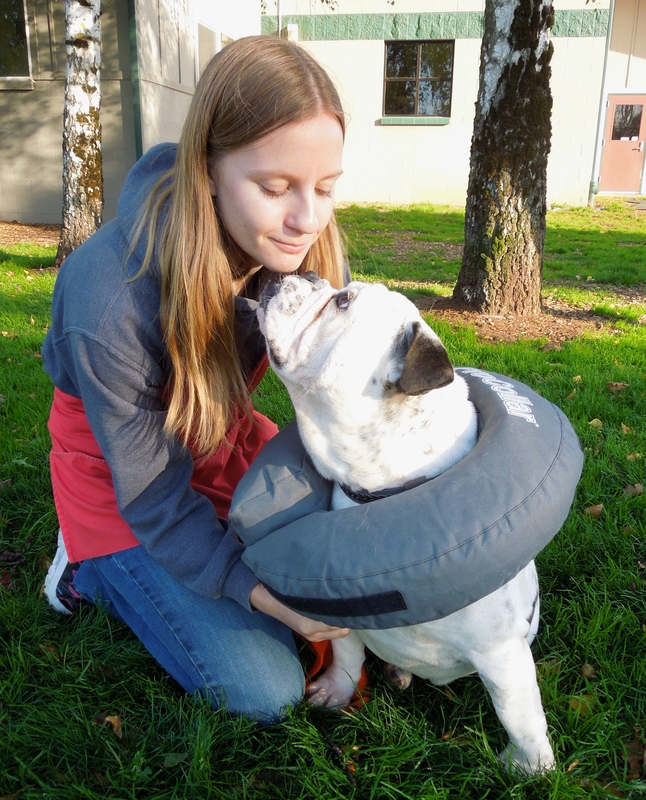 For those of you who have been long-term readers of my blog, you know how much I loved Emma and will remember her amazing rescue story. (You can read about it by typing “Emma” into the search box). I am so grateful that her family keeps in touch with me. Here is the latest. Emma’s fans will be so happy to see how healthy she looks! I can’t wait to see her again! And on that extremely happy update, that’s it for this week! So very very happy to see Emma is doing well. She had captured my heart. Love your Blog.